I really like planning our meals. I love to plan, like to cook and love to eat, so it’s a perfect storm of goodness. I tend to sit down and plan our meals fortnightly, because this helps with shopping, prepping and having things ready to go. Our breakfasts are pretty much the same every day. M will have tea and porridge, I have coffee and muesli. Lunch tends to be soup or salad, unless M goes out with colleagues or school has something awesome on the menu (our lunches are very good at school but I try not to pig out because it makes me sleepy in the afternoon!). So the evening meal is the time where we get to come together and catch up on the day. We rarely do pudding but will occasionally have a glass or two of wine (some meals like steak just seem to demand it!). Monday 14th: Grilled chicken, twice baked potatoes, roasted veg (peppers, courgettes, onion & piccolino tomatoes with a honey and chilli glaze). Tuesday 15th: I’ll be out for dinner with Shona (mmmmmm, seafood! ), so M will probably grab soup or pie and beans. Wednesday 16th: I’ll be out with Eileen (mmmmm, fondue! ), so M’s on his tod again! Thursday 17th: Piri piri chicken, rice and vegetables. Friday 18th: Shona is coming over for a Nashville fest, so I’ll be cooking up southern inspired goodness. Burittos, mashed potatoes, pulled pork, dinner rolls, beans and mac and cheese. A stretchy trousers kind of meal! Saturday 19th: Spicy chicken goujons and baked potatoes. Sunday 20th: We’ll have company over for Easter Day, so I’ll probably do a buffet of light bites – quiche, charcuterie, salad, dips etc. And plenty of chocolate for afters! Monday 21st: It’s a Bank Holiday and the last full day of break, so that calls for pizza. Tuesday 22nd: Beef and veg stir fry with noodles. Wednesday 23rd: Squash and sweet potato soup with fresh bread. Thursday 24th: Oven fajitas – excited to try a new recipe! Friday 25th: Bangers and mash with peas and onion gravy. Saturday 26th: It’s our friends’ Adam and Emily’s stag and hen, so we’ll probably have pub grub out and about. Sunday 27th: Chicken jalfrezi with naan, bombay aloo and mango chutney. Good, hearty food. And now I’m hungry. 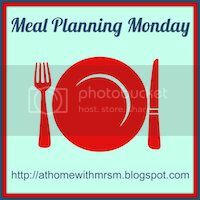 Excited to link up for my first #mealplanningmonday over at ‘At Home With Mrs M’. Thank you lovely – I adore cooking & entertaining! Love the sound of your Nashville feast with pulled pork, burritos and mac and cheese! I'm excited to try some new recipes! You are so organized! Between the two of us our hours are such that we don't get to eat together that much. But when we do it's nice.